Soccer fans everywhere are counting down the days in anticipation of the 2018 FIFA World Cup in Russia, a truly international event that happens every four years. The competition starts on June 14 and Iran will not be left behind this year. After a long and arduous road, the country has qualified for its 5th appearance. Many of you will be cheering on Iran’s national team (Team Melli) as they face one of the toughest groups in the World Cup that includes Morocco (June 15th), Spain (June 20th), and Portugal (June 25th). However, the country’s unwavering fans do not seem to be intimidated by the impressive resume of their opponents and count on their team to shock the world. In a music video, produced by a group of talented Iranian musicians, comedians, and puppeteers, the fans are challenging the likes of Portugal’s Cristiano Ronaldo and Spain’s Sergio Ramos to an unforgettable match. What makes this video my personal favorite, is a perfect mix of childhood nostalgia, respect for past players, country’s love of soccer, and a comical level of bravado. The music video is further perfected by its inclusion of the Bandari music style—a rhythmic type of dance music played in fast and slow tempos mainly in Southern Iran. Do not be confused by the purple puppet! 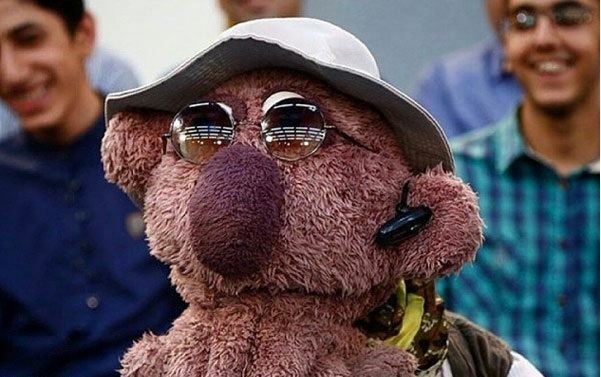 That’s Jenab Khan, a puppet character that makes frequent appearances on Iran’s popular nightly comedy show called Khandevane. The puppet is a big football fan and has actually claimed to be the owner of Paris Saint-Germain F.C. I translated the song for the fans who may struggle to understand the lyrics, especially the fast rhythm of the hip-hop portion. The video includes some esoteric local references, which I try to explain at the bottom of the post. Here's to an incredible World Cup for all, especially for Iran’s Cheetahs! Challenge each other to a nutmeg (through the legs) contest? Where in the world the goalpost is a bucket? The double cut move is ours, brother! You get it? Don’t frighten us of Cris Ronaldo! Where else in the world have you seen shoot-e yek zarb*? Have you ever made a cut with a two-layered ball? He dies after an ACL tear! Have you ever experienced knee effusion? Don’t frighten us of de Gea’s saves! Who are their big ones? Ramos and Castán? Their dribblers are Isco and Alba? If not, cake and drinks on us! Neymar, all of a sudden, we may sweep you up! [Chorus] Neymar…Neymar…we’ve come to Russia! We’ll meg Iniesta in a way that he wouldn't even know where it came from! Mohamed Salah, what do you think? We are just missing Ebrahim Tahami on the team! *This is a soft plastic ball sold at every cornerstone for a very cheap price in Iran. It is used for playing soccer by kids in the streets. It does not need to be inflated because the shell is a hard plastic layer that holds in the air, but at the same time it is too soft to play with in the streets without denting or piercing the outer shell. That is why kids buy two of them, tear one halfway open and wrap it around the second ball. As such, the ball becomes heavier and much harder to damage on the rough street surface. Almost every child in Iran has played with one. The image coincides with a strong sense of nostalgia and also reminds the older generation of the lack of available equipment for youth in the country. *A simple street game that usually takes place between two players. The goals are made out of bricks, school backpacks, or any other random objects lying around. The two players stand in their respective goals and try to score against one another by kicking the ball towards each other’s goals. Each player is allowed one kick and no rebounds. *During the 80s and 90s, the Aideen company produced a series of chewing gum that contained pictures of renowned soccer players. The goal was to collect as many as you could. It was hard to collect all the pictures and often times you'd get a lot of repeats, so a game was created by kids to exchange the pictures in a fair way. You would lay the pictures down, often on top of one another, and hit it hard with your hand. If the pictures flipped as a result of your hit, you would win the pictures you turned. The individual you played would get the same opportunity with the pictures you volunteered for the game. *Iranians refer to players that play for foreign clubs during the year, but join the national team for international games as legionnaires.